Ready to place on the tabbletop! Made from High Quality Resin, and beautifully painted, this Grey Stone Bridge enhances your Outdoors Rivers or Urban Canal Tiles; or can used with gaming surfaces you already own. 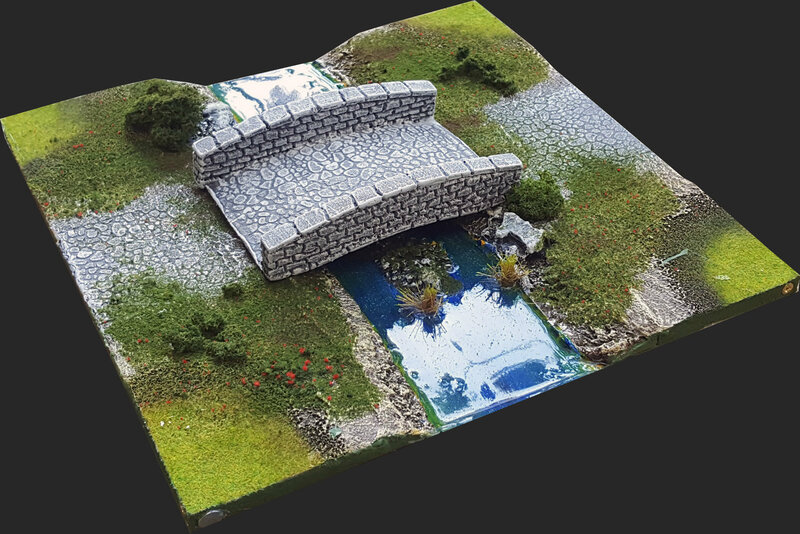 The completely revamped and redesigned Pedion Stone Bridge can be used in any Fantasy, Ancient, Medieval or even rustic Modern environs, and in scales from 15mm to 32mm. The bridge is slightly arched, with a span of 14cm and a width of 9cm (open space width of 7cm). Total height is up to 3cm. The Set includes 1 modular Prepainted Grey Stone Bridge, specifically designed for Pedion River and Canal Tiles. Great for Age of Sigmar, Kings of War, Frostgrave, Bolt Action and Flames of War wargames, as well as role playing game sessions.